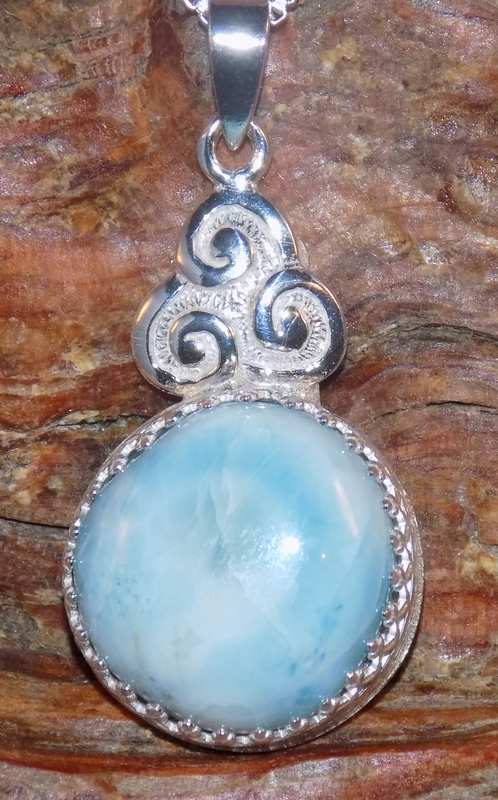 This lovely Larimar pendant is encased in a Sterling Silver bezel, topped with a Sterling Silver Celtic Triskele (Triple Spiral). Larimar is only found in the Dominican Republic. The blues in this stone are striking, and almost match the waters near where it is found. This pendant comes with an 18″ Sterling Silver box chain. $95.00 including free shipping within the US. This pendant is approximately 1 7/16″ tall, and 11/16″ wide including bail.